441, Lot: 21. Closing Apr 03, 2019 at 10:07:00 AM ET. SICILY, Leontini. Circa 476-466 BC. AR Didrachm (20mm, 8.32 g, 9h). 441, Lot: 64. Closing Apr 03, 2019 at 10:21:20 AM ET. THESSALY, Skotoussa. Mid 4th century BC. Æ Trichalkon (24.5mm, 7.77 g, 11h). 441, Lot: 108. Closing Apr 03, 2019 at 10:36:00 AM ET. CIMMERIAN BOSPOROS, Pantikapaion. Circa 325-310 BC. Æ (26mm, 15.00 g, 6h). 441, Lot: 154. Closing Apr 03, 2019 at 10:51:20 AM ET. PAMPHYLIA, Aspendos. Circa 420-360 BC. AR Drachm (19mm, 5.25 g, 12h). 441, Lot: 196. Closing Apr 03, 2019 at 11:05:20 AM ET. PTOLEMAIC KINGS of EGYPT. Ptolemy III Euergetes. 246-222 BC. Æ Obol (24mm, 11.30 g, 12h). Telmessos mint. 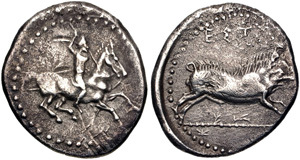 Struck circa 230-222 BC.